12 April 1967. "Showing the derelict steam ferry Peregrine at St Marys Bay." 7-A3836, Sir George Grey Special Collections, Auckland Libraries. Built at the Customs Street yard of Charles Bailey Junior, the SS Peregrine was launched 22 January 1912. 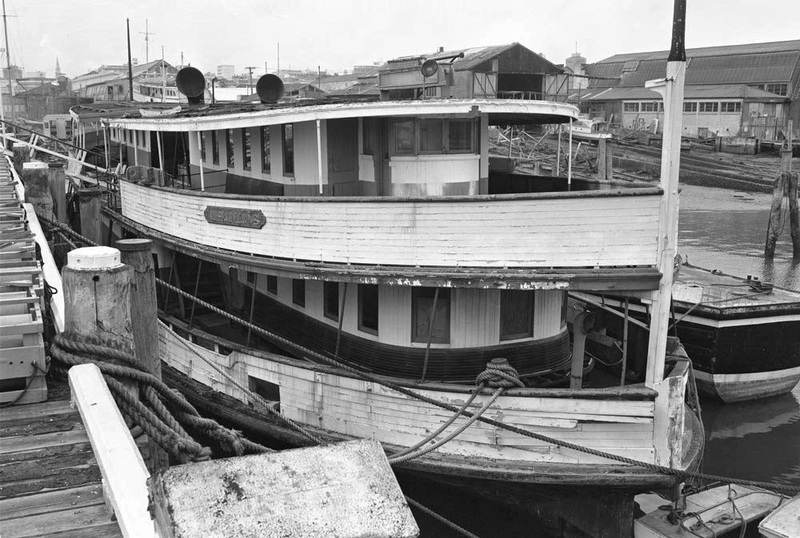 "Puriri was used for her frames, kauri for her planking and decks and the interiors of her spacious cabins were lined with cedar and kauri," according to David Balderston in his book The Harbour Ferries of Auckland. She was replaced as a Devonport ferry by the Toroa in 1925. She was inaugurated on a Waiheke service in 1943, but soon replaced by the Ngoiro. The Harbour Bridge spelled the end of the Peregrine's service on the harbour. Quoting Balderston: "Her old engines were scrapped soon after she was laid up at the Beaumont Street yard, and her hulk remained there, rumour had it, awaiting a new diesel engine and a Kestrel type refit. Sadly, this never happened and she slowly rotted and rested at the wharf. In March 1981 she was towed into the reclamation at Westhaven and broken up." Interesting to see the boat rafted alongside the Peregrine. I believe it is the WWII Fairmile P3571 (originally Q411), decommissioned by the Navy in 1965 and sold to North Shore Ferries. For whatever reason she was never put into service, but laid up at St Marys Bay until 1982. Sold into private ownership, she became a sad, familiar presence on a mooring just north of the Greenhithe Bridge until a couple of years ago. Now in Whangarei as far as I know.